If you are looking to buy an electric tea pot, I first need to know what you mean by the phrase electric tea pot. A “teapot” is generally used for steeping tea, while a “kettle” is designed to heat or boil the water. Sometimes both functions are combined like with the Breville Tea Maker (which I own and love). They call this a tea maker, among other things. Not only does the tea maker warm up the water to the correct temperature (like a kettle), but it then lowers and steeps your favorite loose leaf tea into the water (like a teapot). Even searching some of the most popular online sites for the term electric tea pot, they end up talking about both electric kettles or electric tea makers. These devices get rid of the need for any kettles or teapots, and are your one-stop-shop for brewing tea. Many electric tea makers allow you to control the temperature and steeping time of your favorite loose leaf tea. I personally use the Breville version, which is expensive, but appears to be the best on the market. There are various functions on electric tea makers that can add to their quality such as automatic temperature/time control, pre-set brewing times such as in the morning, a keep warm function, being BPA free, and allowing for easy cleaning. It also helps if the price is right. I was able to get my Breville Teamaker for $200, which was on sale from its normal $250 price tag. These devices warm up or boil hot water for you, which you can then use to steep your tea, whether in an infuser mug, cast iron teapot, or more. The more expensive kinds will have a built in thermometer so that you can warm your water to the correct temperature. These electric kettles also can be used to quickly warm up water for hot chocolate, oatmeal, soups, and more. The price really depends on which features the electric tea kettle offers. For example, you may want full temperature control, a keep warm function, quick heat up time, electric controls, a non slip handle, auto-shutoff, and a decent size to hold enough water. Full temperature control is really the most important because different teas require different temperatures to be brewed at. You are going to ruin the flavor of green tea if you brew it at boiling temperature. 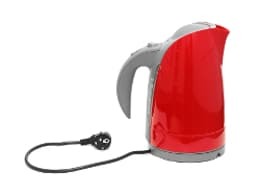 Whether using an electric tea maker or electric tea kettle, you are adding convenience by avoiding having to use your stove at home, and can bring these devices to the office to plug into an outlet. Electric tea pots also make great gifts for anyone you know who loves tea. My tea maker has made me become addicted to loose leaf teas and their various blends.